Induce relaxation of the forearm muscles. Provide for use that will not interfere with daytime activities. Provide a device comfortable enough to comply with prescribed use. Allow immediate use of fingers for simple hand activities. Prevent extreme forward bending of the wrist. 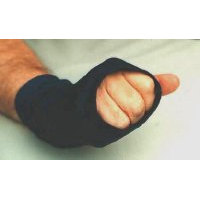 Provide compression on the hand and fingers that does not restrict blood flow. Note:There is no warranty on this product and we are unable to offer our 30 Day Customer Satisfaction Guarantee.